Hanko is a bilingual port town and municipality on the south coast of Finland, 130km west of Helsinki. Start off your visit on the 20th (Mon): take in panoramic vistas at Hanko Water Tower, look for all kinds of wild species at Tulliniemi Nature Path, and then kick back and relax at Bellevue Beach. To see where to stay, maps, and tourist information, read Hanko trip itinerary builder site . London, UK to Hanko is an approximately 9-hour flight. You can also drive. The time zone difference when traveling from London to Hanko is 2 hours. Traveling from London in May, plan for slightly colder nights in Hanko, with lows around 5°C. Finish your sightseeing early on the 20th (Mon) to allow enough time to travel to Kuusamo. Kuusamo is a town and municipality in Finland. Kick off your visit on the 21st (Tue): relax in the rural setting at Palosaari Reindeer and Fishing Farm, take an exotic tour of a safari tour, and then explore the striking landscape at Kiutakongas Rapids. Take the guesswork out of planning a Kuusamo vacation by using our trip itinerary maker. The Route module can help you plan travel from Hanko to Kuusamo. In May, Kuusamo is a bit cooler than Hanko - with highs of 11°C and lows of 1°C. Wrap up your sightseeing on the 21st (Tue) early enough to travel to Imatra. 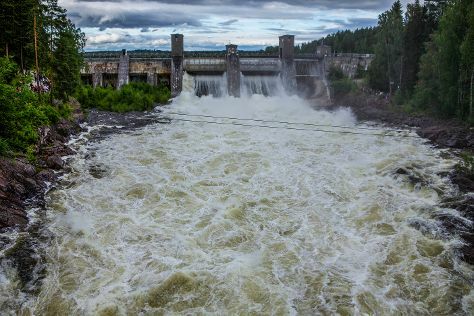 Kick off your visit on the 22nd (Wed): admire the sheer force of Imatra Waterfall, take in the spiritual surroundings of Tainionkosken Church, take in the spiritual surroundings of Church of St. Nicholas, then step off the mainland to explore Malonsaari, and finally head off the coast to Lammassaari Island. To see more things to do, traveler tips, where to stay, and other tourist information, you can read our Imatra trip planner . Do a combination of flight and train from Kuusamo to Imatra in 5 hours. Alternatively, you can drive; or take a bus. Prepare for a bit warmer weather when traveling from Kuusamo in May: high temperatures in Imatra hover around 17°C and lows are around 6°C. Wrap up your sightseeing on the 22nd (Wed) early enough to take a train to Kouvola. Kouvola is a town and municipality in southeastern Finland. Kick off your visit on the 23rd (Thu): identify plant and animal life at Niivermaki Nature Conservation Area, stroll through Hiidenvuori, and then identify plant and animal life at Arboretum Mustila. Get ready for a full day of sightseeing on the 24th (Fri): take in the architecture and atmosphere at Marian Kirkko, then kick back and relax at Beach Mansikkalahti, then go for a walk through Linden Esplanade, and finally identify plant and animal life at Riverside Park. For more things to do, reviews, ratings, and other tourist information, read our Kouvola holiday planning tool . Traveling by train from Imatra to Kouvola takes 1.5 hours. Alternatively, you can drive; or take a bus. In May in Kouvola, expect temperatures between 18°C during the day and 6°C at night. Cap off your sightseeing on the 24th (Fri) early enough to go by car to Pori. Pori is a city and municipality on the west coast of Finland. 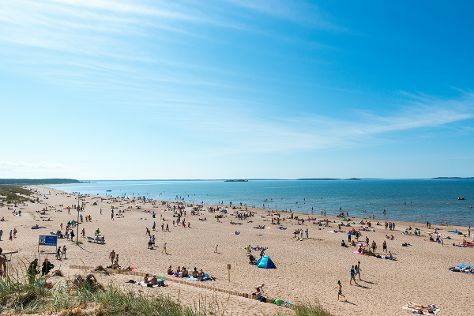 Kick off your visit on the 25th (Sat): take in the spiritual surroundings of Central Pori Church (Keski-Porin kirkko), then make a trip to Juselius Mausoleum, and then enjoy the sand and surf at Yyteri Beach. To find ratings, maps, traveler tips, and tourist information, you can read our Pori online vacation planner . You can drive from Kouvola to Pori in 4 hours. Other options are to take a train; or do a combination of train and bus. In May, daytime highs in Pori are 17°C, while nighttime lows are 5°C. Finish your sightseeing early on the 25th (Sat) to allow enough time to travel back home.